Estate LOS ALMARACEJOS. Merino Sheep Farm. 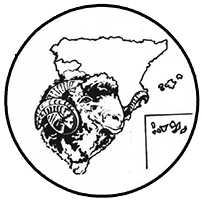 La Llave is part of the National Association of Merino Sheep since 2015. It is a line of the Merino sheep, big size, with longer limbs, face and legs a little exposed and wool with fibres of medium length and very thin. They have a "darker" appearance. It is cable of a large production of milk within the possibilities of the breed. The merino breed can be found throughout the world. 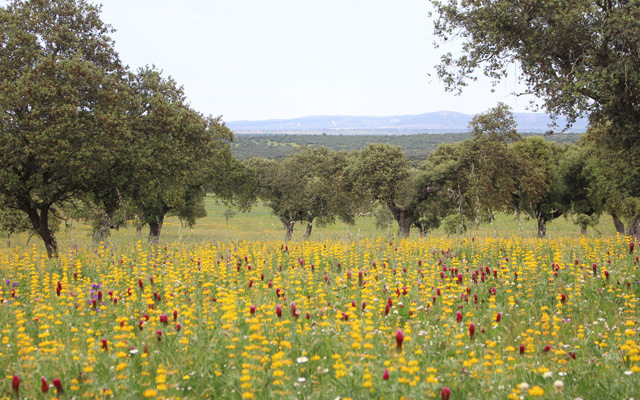 In Spain is present in 75% of the territory but is mainly concentrated in the Dehesa of Extremadura and Andalucia. The Merino breed has a long life and is a strong sheep against the hardness of the climate. In general it is resistant to diseases and therefore with a high longevity. 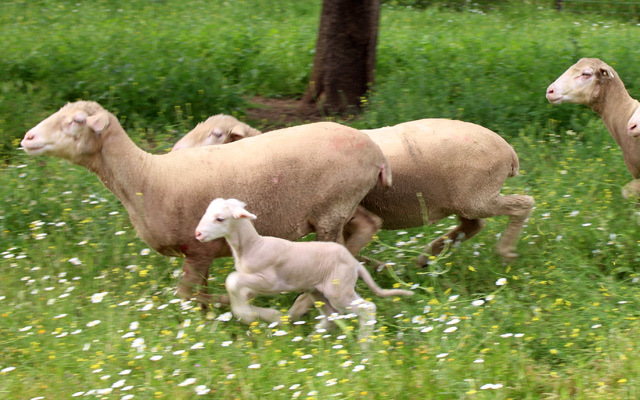 After a profound refurbishment and enhancement of the estate's facilities and, the commitment to feed the sheeps with natural pasture, currently within the Farm there are approximately 1500 "sheep mothers" who feed mainly on rainfed crops, with high protein value, and from the acorns of the oaks. Our Farm is divided into land plots of about 25 acres each to facilitate the day to day handling of the sheeps and ensure the best optimisation of grass and acorns. In order to enrich the soil and improve the trees, the sowing of permanent grass pastures is rotated to feed the sheeps. 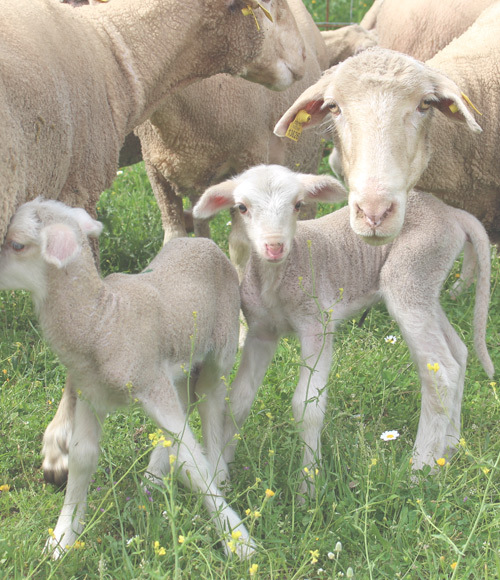 With the proper care and feeding many of our sheeps give birth to twins in a high percentage. Read more about reproduction. How much sheeps usually weight? 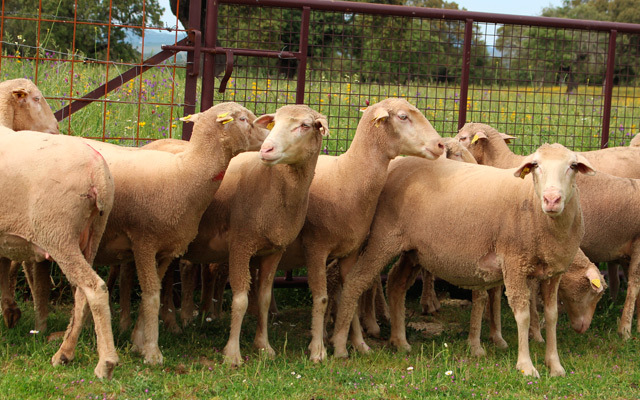 Currently we can estimate the weight of an adult female merino sheep to be between 40 and 70 kgs and, between 70 and 100 kgs in the case of males breed. It is a legacy of the history of Spain that we must preserve for future generations, a treasure that once had a strategic status under the control of the Mesta. 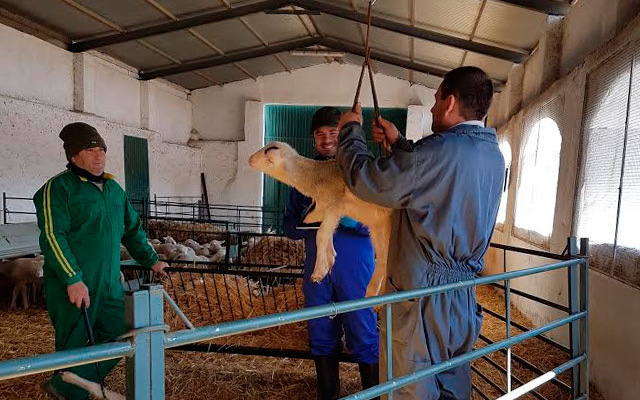 The Commission of Admission, Qualification and Improvement establishes the conditions and periodicity of the blood tests that sheep must go though, which are mandatory for this breeder, so that its refusal could lead to the exclusion from the Farms´Register. 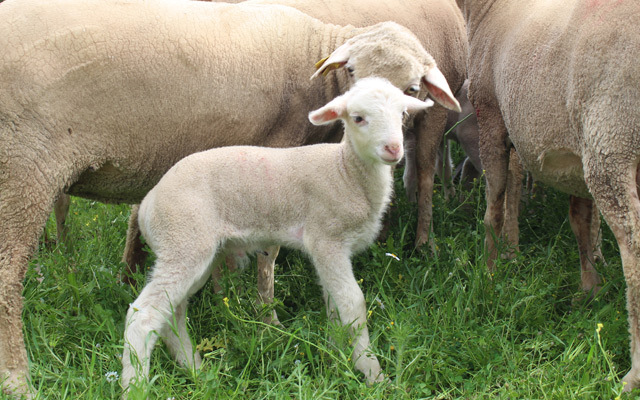 Registered in the National Association of Merino sheep breeders , we are carrying out all the selection, genotyping and filiation processes proposed by the Association. The farm of the Hidalgo Pérez brothers, de Sena de Luna (León), had great importance in the first half of the 20th century, being the only Leonese farm that has managed to reach our days. Its origin possibly dates back to the nineteenth century. 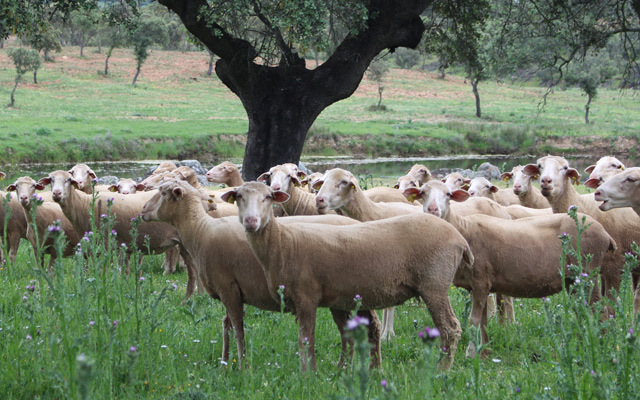 The sheep come from the old and famous sheep farm of the Duque de Fernán Núñez, who owned a large area of ​​land close to the border area between the regions of La Serena and La Siberia, with ancestral home in Siruela (Badajoz). Probably, some ancestor of the Hidalgos was a shepherd in the house of the Duke of Fernán Núñez and this is how could have all started.. The Hidalgos farm was never very large, in the twentieth century did not exceed 3,000 sheeps, but it was very selected. Dehesa is a forest formed by arboreal species of Quercus, with lower layers of pastures or bushes, where the activity of the human being has been intense, and are generally intended for livestock maintenance. It is a typical example of "agrosilvopastoral" system and typical of the western area of ​​Spain. 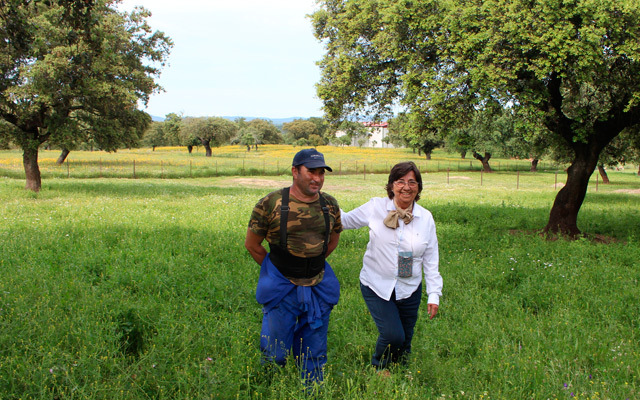 The developed system has great economic and social importance in Extremadura, both because of its superficial extension and because of the function of fixing the rural population in its centres. 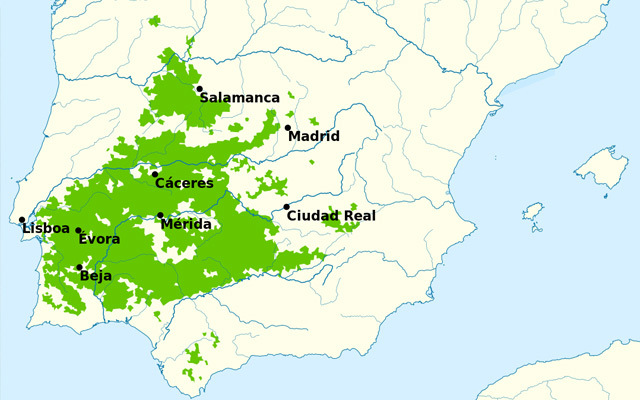 4 millones hectares in the Iberian Peninsula. The history of the Merino breed is linked to the history of Spain and dates back to the colonization of the benimerines (banu marin) of Morocco that invaded the province of Cádiz in the 14th century. Other theories relate his name to the tax collectors of the Kingdom of León "the Merino" who collected the tithes in the form of wool, cheese or jerky. The origins of the breed, that could have had its beginnings in North Africa, in Carthage or perhaps n the Near East, are not known exactly, but its exploitation and valorization corresponds to the Honorable Council of the Mesta de Pastors that was created in 1273 by Alfonso X the Wise. In 1786 France secretly acquires a herd of merino sheep under a treaty signed by Louis XVI that will give rise to the Rambouille race of great importance in the past. 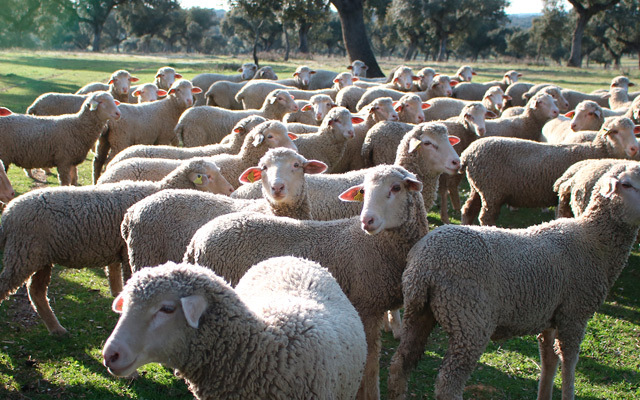 For centuries the monopoly of wool held by Spain was the object of laws that prohibited the exit of merino from the country. The shepherds are a team of professionals who know their job very well and know how to meet all the needs of a modern sheep farm. 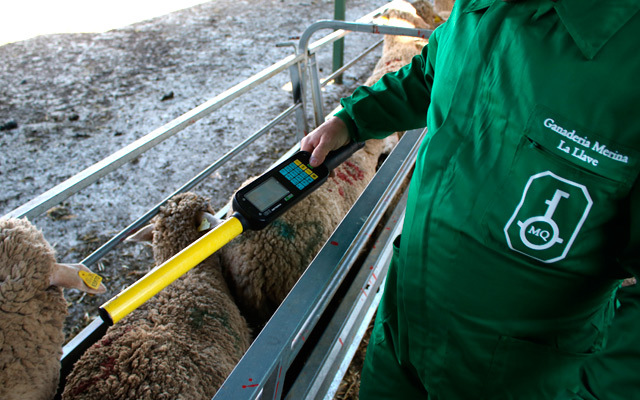 People using new technologies and aware of the advances that make livestock more efficient. Our team of shepherds counts on the invaluable help of the Border Collie shepherd dogs that handle the movements of the herd greatly. The history of LA LLAVE! Only with the correct key the doors that the future holds can be opened. 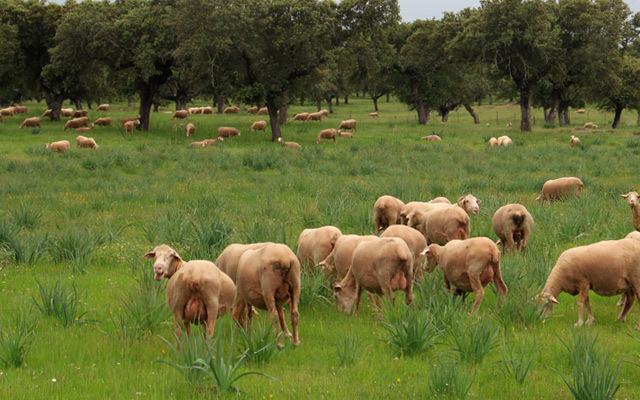 The Extremaduras' estates in which these Merino sheeps have grazed are Casas Caídas, in Puebla de Alcollarín (Badajoz) and El Hinojo, in Mérida (Badajoz). In summer they were moved to the areas of Sena de Luna (León). In the last decade of the last century, they only kept about some 700 sheeps that made the transhumance by truck to the estates owned by the Hidalgo family Sierras Blancas, Campo Lamoso and Panazal, in the municipality of Villafeliz de Babia (León). 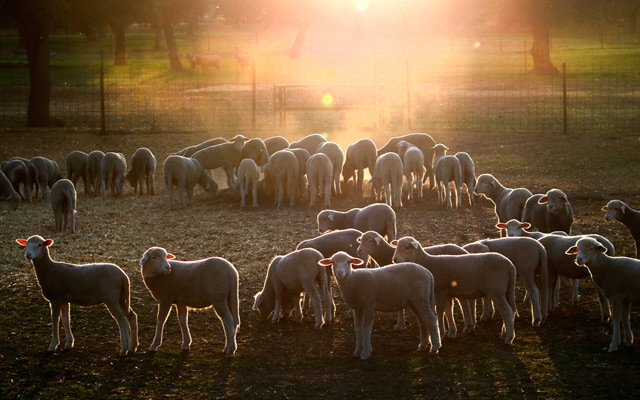 After many years of leasing the estate and unfortunately seeing its gradual deterioration, we decided to manage directly the exploitation of the Estate with a sustainable project, viable and respectful with the environment, also contributing to the protection and breeding of native sheep breeds as is the case of pure merino sheep. We created the project, with the belief and the illusion of giving our descendants a vigorous estate and a farm with a viable future project. 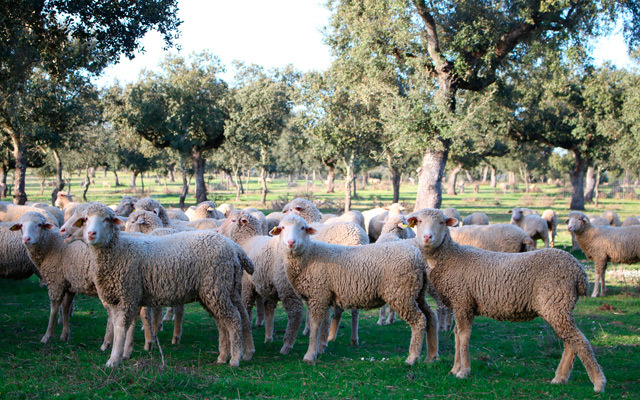 After a profound refurbishment and enhancement of the Estate's facilities and the commitment to feed the sheeps by natural pastures, currently within LA LLAVE there are approximately 1500 "sheep mothers" who feed mainly on rainfed crops, with high protein value, and from the acorns of the oaks. To progress respecting tradition and origins, continue to develop to the pace of a new generation mixed with the sap of experience and maintaining the passion, illusion, determination and family spirit that are the essence of LA LLAVE. We believe in the conservation and improvement of the nature to achieve a balance between the sustainability of the ecosystem and productivity. 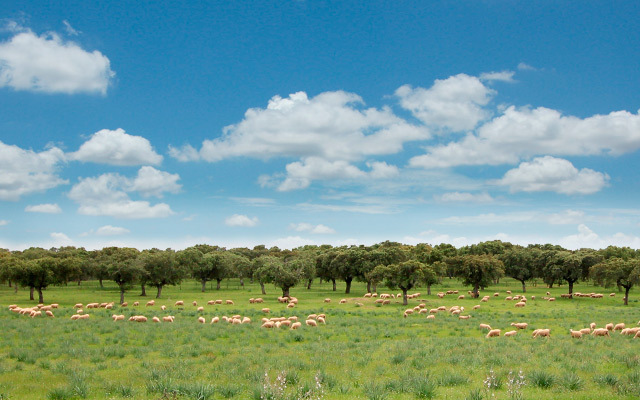 We believe in improving the genetics and the care of our sheep of pure Merino breed, to obtain that the sheep farm "LA LLAVE", is referent in the ovine sheep of quality. We believe in being able to produce and transform our products. We are committed to achieving a viable and sustainable project for the future. 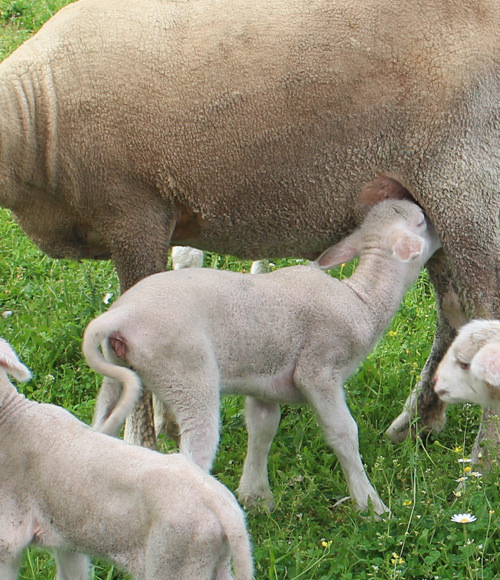 We sell reproductive "sheep mothers"